The PrismJET VJ24X’s metallic ink capabilities of are pretty cool features. Lots of customers use them to create dazzling prints with chrome-effect spot colors and metallic underlays. You can give your prints the look of metallic paint or nail polish with the right blend of ink and effects. Since white and silver aren’t process colors, the um…process for using them is a little different. There are a few extra steps required in design and production. To help you access these features, we offer this step by step guide to printing with metallic ink. We’ll look at the essential software elements, design elements, and Production Manager settings. Before you begin, you’ll need a few digital essentials. These resources are critical to the design and production of your metallic ink prints. You’ll need the Mutoh Metallic Spot Color Library, an eight color preset, and a printable metallic spot color guide. The MUTOH Metallic Spot Color Library is essential for encoding the white or metallic spot colors into your design. This is imported as a swatch table into FlexiSign & Print or LXI RIP Design 12. The PDF version of this file is simply a printable guide that you can keep on hand as a design reference for you and your customers. It gives you an instant visual palette of all the metallic colors available. The other essential tool is the metallic preset. This is an addendum to the ICC profiles that enables the spot color matching function in LXI RIP 12 Production Manager and supports the white and metallic ink driver options. There are different presets for use in FlexiSIGN & Print and LXI RIP 12. 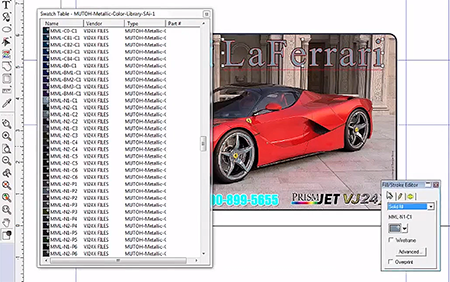 If you’re using LXI RIP 12, the file you’re looking for is 2MUTOH Metallic Color Library VJ24X.ptf. Speaking of profiles, the importance of this cannot be overstated. We always recommend that you use the right profiles for your media. With the VJ24X, this is even more important because the profiles are based on a specific driver and ink configuration. Make sure you’re using the right preset and profiles. These are the foundation for everything else you’re about to read. You’ll find all these essential resources here. This requires adding the MUTOH Metallic spot color palette to the LXI RIP Design interface. From the top nav tool bar, click the View tool. From the drop down menu, click Open. Then, from the fly-out menu, choose Open Table. FIG 1: Use the fill/stroke editor to replace standard spot colors with metallic hues. Browse to the folder in which you saved the library and click to open it. This will add another color palette to your gui. Each value in the table is a specific blend of silver ink. Now you can click on any vector element in your design and use the Fill/Stroke editor to replace the fill with one from the metallic spot color library. There’s quite a range of colors to choose from. If you’ve downloaded the PDF version, you can keep it on hand as a quick visual reference. It makes picking the color you want a little easier. For a brilliant, silver metallic accent, choose MML-NI-C1 (FIG 1). FIG 2: You can layer vector fills with metallic under transparencies. To create a metallic under layer that adds a silvery sheen to your process colors, you can stack vector elements in your design. Fill the element on the bottom with silver. Fill the element on top with a standard fill. Then use the Transparent fill option to reduce the opacity of the top element. This is a way to produce a custom metallic color or effect. You can layer a gradient fill with an opacity of 55% over the silver spot color. When printed, the silver metallic base layer adds a silver pearlescent effect to the entire range of the gradient fill. The lower the opacity of the top vector element, the more the metallic ink will show through on the print (Fig 2). Because we’re printing with spot colors, we don’t want to use the standard RIP & PRINT process. To RIP the image correctly, select your design and export it as an .EPS file. The .EPS format encapsulates and preserves the raster and vector data, including the metallic spot color values. Then open Production Manager. The first thing we need to do is import the correct preset. From the top nav bar, click File. From the drop-down menu, select Import Preset. Then browse to the folder in which you downloaded the preset file and open it. 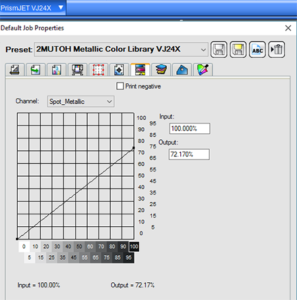 The MUTOH Metallic Color Library VJ24X preset is essential for spot color matching. FIG 3: Start here. Everything in Production Manager depends on the preset. 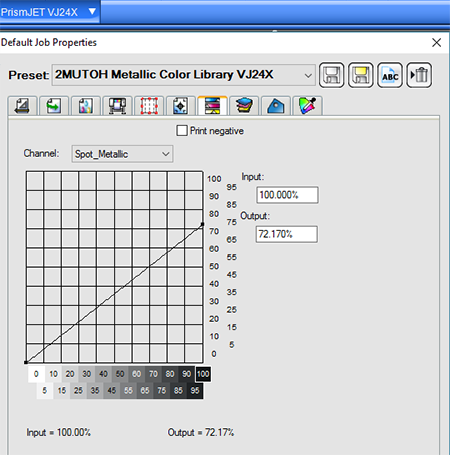 To make sure the preset has been imported, right-click on the PrismJET VJ24X just above the Output queue. From the drop-down menu, select Default Job Properties. You should see the new preset at the top of the Default Job Properties window (Fig 3). To make sure everything is set correctly, click the Color Management Tab, then click the Color Mapping button. The Custom Spot Color Matching window should open with the entire range of MUTOH Metallic spot colors and their process color values listed. While you’re in the Color Management tab, select the best profile and make sure the color mode is correct. For printing with metallic ink on glossy vinyl, choose the VJ-628X McGann Gloss Photo Paper profile. The Color Mode should be CMYKLcLmW Metallic (Variable dot). Click on the Advanced button and make sure the correct input profiles are selected. They should be GRACoL2006_Coated1v2.icc and sRGB IEC61966-2.1 (click here for more about the importance of input profiles and how to reset them). White and Metallic Ink Settings: Once you’ve set the ICC profiles and verified that the spot color matching is active, it’s time to select the right white and metallic ink options for the effect you want. This is done in the adjacent Driver Options tab. This is where you would normally set things like the printer heater temperature, scan area, and wave printing weaving effects. Near the bottom of the window is the White and Metallic Options button. Here you will find various settings for the white and silver metallic spot color channels. 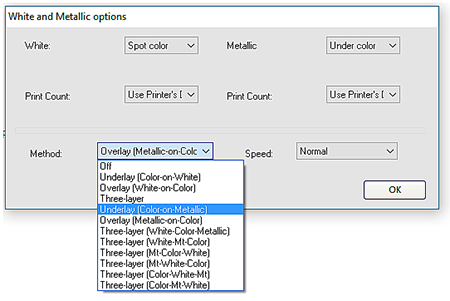 These include 6 layer options, a print count setting, 12 method options, and a speed setting. All of the most important settings for optimizing your use of white and silver ink are in this window. White/Metallic: The best process is to work from top to bottom. Begin with the White or Metallic option that determines where the white or silver ink will be printed in relation to the process colors. The default value here is spot color. If you want to print a brilliant silver spot color over a process color design, keep the default Spot color setting. 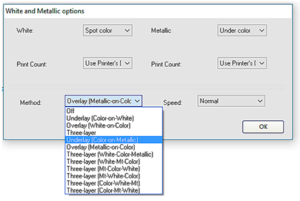 To print a process color transparency over silver, as seen in Fig 2, choose “Under Color” here. Print Count: Keep the Print count setting as Use Printer’s default unless you want to add more opacity. This is generally not needed unless you’re printing white over clear media. FIG 4: Here are the Metallic and Method settings for silver under color. Method: This is one of the most important windows. The method determines where the spot color is printed in relation to the process colors. To print brilliant silver accents over process color, choose Overlay (Metallic-on-color). If you want a metallic finish to your process colors and have a design with stacked vector shapes, choose Underlay (Color-on-metallic). If you’re printing on clear media and want to print a white underbase, then add process color with a silver accent on top, choose one of the Three layer methods. Just make sure the method used matches the elements in your design, and that options under Metallic match the Method used (Fig 4). Speed: The speed option allows you to slow the print speed on the spot color channels. The options are Normal, Slow, and Fast. If you’re printing a solid layer of white or silver under process color, it’s a good idea to opt for the slow setting to allow more time for the underlay to dry before the top layer is applied. Once you’ve set the White and Metallic options and chosen the right Method and Speed settings, click OK. You’re almost ready to print. There’s just one more key setting before you hit the Send command. When you’re printing white or silver under process color, it’s a good idea to reduce the ink limit on the spot color channel. You might think this would dramatically blunt the effect, but that’s not the case. A little goes a long way. And printing with all channels at 100% may lead to over-saturation and puddling. FIG 5: Reduce the spot_metallic ink limit when printing silver over or under color. Reduce the ink limits by opening the Color adjustment tab (7th from the left). The default view here is a diagonal line from 0 to 100 showing all channels. Click the arrow next to all and, from the drop-down menu, select Spot_White or Spot_Metallic, depending on your design (Fig 5). If you’re printing a silver spot color over CMYK, you can leave the Spot_Metallic limit at around 70% and get great results. To do this, mouse over the point where the line meets the vertical axis. Click and drag the dot downward to reduce the limit. The line should remain straight. To achieve a metallic effect under a transparent process color fill, you can reduce the spot_metallic value to as low as 40% and still get the desired pearlescent effect. The more opaque your process color layer is, the higher your silver ink limit should be. The main benefit of this step is to prevent over saturating the media so that your prints look great and are ready to use right off the printer. But it also reduces ink cost. And since the white and silver ink costs more than CMYKlcLm, that’s a good thing too. 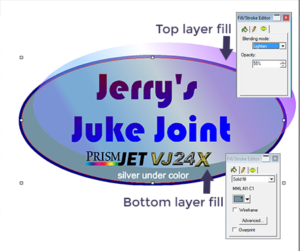 So now you have all the tools and settings for creating dazzling prints with your PrismJET VJ24X. You can add silver spot colors to draw attention to prints, or add exotic pearlescent color with silver under process colors. Remember to begin with the end in mind by designing your image to match the metallic spot color settings in Production Manager. If you still have questions, or would like to see the entire process carried out in real time, drop in on segment two of our archived PrismJET VJ24X webinar.